All wireless mini speakers are not created equal. Connect UGO to your favorite device and enjoy the deep bass and clear tones of your favorite music. You won't believe that a package so small can create sound so big. 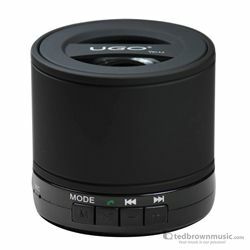 UGO Bluetooth wireless mini speakers are the ultimate combination of versatility and portability. Bluetooth connectivity will stream your music wirelessly from up to 30 feet away, without a mess of wires or a speaker dock system. Cut the cord and bring the freedom of movement to your music with UGO wireless mini speaker - premium sound wherever you go.